10th Dist., page 91a, house 616 Oak St. Elizabeth H. PRYOR 10/1837 62 widow 10 children/2 living VA VA VA, William H. son 7/1875 24 KY VA VA, Philip J. son 7/1883 19 TN VA VA.
Samuel E. PRYOR 45 KY KY KY, Eliz F 40 wife KY KY KY, Mary C 14 dau KY, Sam 14 son KY, Martha 12, William 5, Virginia 3. Trenton Twp. Page 461a. Samuel D. PRYOR 35 farmer VA, Elizabeth 32 VA, Richard G. 11 VA, Elizabeth V. 9 VA, Mary C. 6 VA, Samuel 4 VA, Pattie 2 VA, Samuel Gains 28 lawyer VA, Ada S. 22 VA, Frances 1 VA. When I read this obit of a Richard Pryor of Clarksville I wondered who he was. Searching for him in Ancestry and through Google didn’t turn over easy answers, but answers I found. Richard Pryor Dies Suddenly at York, Alabama. There are many people in Clarksville who will be pained to learn of the death of Richard Pryor, formerly of this city. He died Saturday last at York, Ala., and was buried Sunday. The Pryor family, it will be remembered, lived in Clarksville for several years and were well liked here. Richard Pryor, by the death of his father, had the care of a family thrown on him when he was a mere boy. He went to work, however, and supported his mother and sisters well. At the time of his death he was a popular paper drummer, travelling for Louis Snider & Sons, of Cincinnati. He was popular with the trade and his death will be very much regretted. He died of an attack of cramp colic. I found this Pryor family on the 1870 Census in KY. If Richard and his mother and siblings lived in Clarksville, TN it was perhaps after 1870. I found his uncle Samuel Morton Gaines was living in Hopkinsville, Christian County, KY in 1880. Remember Richard’s uncle was Samuel Morton Gaines, two Chancery Court Cases help to explain the relationships– Samuel E. Pryor was married to Elizabeth F. Gaines and Samuel Morton Gaines was her brother. 1861 Chancery Court Case – Richard N Venable and the heirs of E W Morton Vs. the Executor of Elizabeth W Morton. One of the heirs was Elizabeth “Betty” Gaines the wife of Samuel Pryor, daughter of Martha W. Gaines, a daughter of Elizabeth W Morton. 1864 Chancery Court Case for the estate of William Gaines includes his daughter Elizabeth F Gaines Pryor and her husband Samuel E. Pryor. I suspect Richard’s father, Sam E. Pryor, is same the Samuel who was counted in a school on the 1850 Census. I know, I know… all those gosh-darn Samuel Pryors in Virginia! I have in my notes that Samuel E. Pryor was Samuel Edward Pryor, the son of Samuel Pryor and Mary Ann Withers. Hope this helps someone searching this line. ** 1867 Samuel M. Gaines married Ada S. Leake in Albemarle Co., VA. In 1809 John C’s and Nicholas’ brothers Zachariah B. and Banister S. were summoned from Buckingham County (their home county) to testify in a Chancery Court case in Prince Edward County. Banister was recorded as the Post Master in Hermitage, Prince Edward County in 1817. I love this line of Pryors — they were all so intent upon getting government positions that they left trails all over the place! 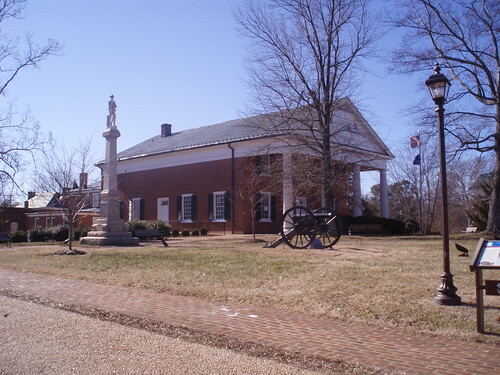 Banister was not only the Post Master in 1817, but also recorded as the Post Master in Hermitage in 1831 AND in 1840 he was the Post Master in Red House, Charlotte County. Nicholas B. wanted a military appointment and after moving to Nashville served as a county commissioner. When Nicholas’ children moved on to Arkansas his son by the same name served as Post Master and as did another son, Cornelius David Pryor. John C. Pryor didn’t get the job as a tax collector. An article in Virginia Magazine of History and Biography states that John C. Pryor was a judge by the time he settled in Desoto County, MS. Even better evidence is a will I located online which he signed in 1846 as a judge in the probate court. http://msgw.org/desoto/court/campamiel.html. So it appears that eventually he too served in a public position. I think we may be able to figure out a stray Samuel Pryor that was floating around Virginia in the early years after the American Revolution. There’s a Pryor will in Charlotte County, VA.
Will of Robert PRYOR written in Dec 1779, proved Apr 1780. Names wife Mildred Pryor, son Samuel PRYOR (a minor), Martha PRYOR, Prudent PRYOR, Mary PRYOR, and Elizabeth PRYOR daughters of Samuel PRYOR deceased. Robert Pryor has been referred to as a son of Samuel Pryor and Prudence Thornton by other researchers and I seem to remember J. Gatewood Pryor in his book also states Robert was Samuel’s son. While I can’t find any documents that name Robert as a son I may be willing to take that leap. Samuel Pryor is supposed to be the son of Robert Pryor and Virginia Betty Green, so it’s not unlikely that he would name a son after his father. Robert Pryor in his will left his estate to his minor son named Samuel (again, this possibly follows the tradition of naming a child after one’s father). Robert also included four Pryor women who were the daughters of another Samuel. Could this “other” Samuel in Robert’s will be his brother and the son of Samuel and Prudence? I’ve seen family trees that indicate that Samuel Pryor and Prudence Thornton had a son named Samuel, although I’ve found nothing about him. And again in the book by J. Gatewood Pryor he stated Samuel and Prudence had a son also named Samuel, although he mistakenly stated that it was the Samuel who married Frances Morton. If this “other” Samuel only had female heirs (Martha, Prudent [sic], Mary, and Elizabeth) and was deceased by 1779, it’s not out of the question that researchers have not focused on his line, nor found out more about him. And it is intriguing that this “other” Samuel named a daughter Prudent (or Prudence? ), possibly after his mother Prudence Thornton Pryor. I guess as we move forward to solve the Pryor lines in Virginia, we have to ask if other Samuel Pryors in the records are “this” Samuel Pryor.